Nineteen-year-old Amanda Andruzzi had never forged a strong connection with any man before she met twenty-three-year-old Jim. But when he walked toward her on the night of their first date, Amanda’s reluctance slipped away. As she became lost in his dimpled smile and green eyes, Amanda could have never known that three years later she would embark on a dark, long path lined with addiction, lies, and fraud. In her inspirational memoir, Amanda shares an intense glimpse into her twelve-year relationship with a high functioning addict and con artist who manipulated and controlled every situation to provide for his own twisted needs. As she describes living with an addict, Amanda reveals how she slowly began to uncover the truth about the father of her child—a man who defrauded clients and close family members out of millions. Although she had the resources and knowledge to obtain help, Amanda discloses how she still felt alone, frightened, and mentally battered. It was only after she exhausts every outlet that she finally learned to let go and allow the healing process to begin. 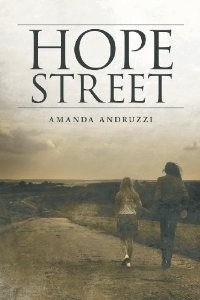 Hope Street is the inspirational story of one woman’s frightening journey of co-addiction that eventually led her to discover the courage and inner strength to overcome great adversity. Co-addiction, codependency, addiction, married to an addict, let go of an addict, memoir, drugs, family, recovery, healing, loving an addict, spouse of an addict, addict, living with an addict, drug rehab center, addiction and the family, addiction support, al-anon, help for families of addicts, recovering addict, relationship with addict, drug abuse, family substance abuse, family substance abuse counseling.